Living cells are constantly making decisions: when to eat, when to move, even when to die. Viruses must also make decisions, but at a much simpler level. This simplicity makes them the perfect subjects for study of regulatory networks. The lambda bacteriophage has been a favorite of scientists, since it only needs to make one big decision during its life cycle. Usually, it follows a lytic life cycle: it enters cells, forces the cell to make many copies of itself, and finally bursts out of the cell, ready to infect more cells. However, if times are lean, the bacteriophage can decide to switch to a less violent approach. In the lysogenic phase, it integrates its genome into the bacterial genome, and then it is replicated each time the bacteria divides. It hitchhikes in the bacterial genome until some signal, such as DNA damage, causes it to switch back to the lytic phase and continue its campaign of destruction. Several proteins together make the decision about which type of life cycle is best for the current situation. At the center of this regulatory network are the cI repressor and cro proteins. Together they form a switch, with cI repressor maintaining the lysogenic state and cro initiating the lytic state. The cII protein is the "final arbiter" of the decision, flipping this switch to the lysogenic state if the conditions warrant it. When the time is right, cII protein binds to three promoters in the bacteriophage genome, which leads to expression of the cI repressor and a DNA integrase enzyme, and inhibition of Q, a key protein in the lytic state, and the DNA excision enzyme. Researchers have been studying the cII protein for decades, and have anxiously awaited a look at the structure of this interesting protein. The cII protein poses two mysteries in molecular recognition. It is a tetramer of four identical chains, but it binds to promoters with only two repeats, with the sequence TTGCNNNNNNTTGC. Also, since these two repeats are tandem repeats, and not palindromic, the protein can't be perfectly symmetrical. In collaboration with Seth Darst's laboratory at the Rockefeller University in New York, researchers at the Midwest Center for Structural Genomics have obtained the first look at how this protein recognizes its DNA promoter, solving both of these mysteries with structures of the protein alone and the protein bound to a short piece of DNA. The cII protein contains DNA-binding domains that are connected together with flexible linkers that allow them to break symmetry and find the best orientation on the two TTGC repeats. The four chains associate into two dimers, and in each dimer, only one of the chains actually contacts the DNA. The DNA-binding domains make specific contacts with all four base pairs in the TTGC recognition sequence, reading the arrangement of DNA atoms in the major groove. These include hydrophobic interactions with the methyl group on the thymines, and hydrogen bonds with the cytosines and guanines (some using a water molecule as intermediary). The lambda cII protein uses several different methods to recognize its promoter sequence in the DNA. 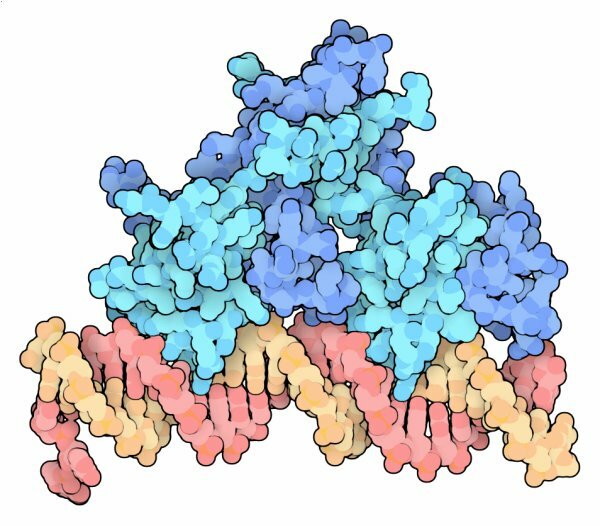 In this picture, the DNA-binding domain of the protein is shown in blue, and the two DNA strands are shown in pink and orange, with the four base pairs in the recognition sequence in bright colors, and the flanking regions darkened. Four sidechains from the protein extend into the major groove and form hydrogen bonds with the bases. 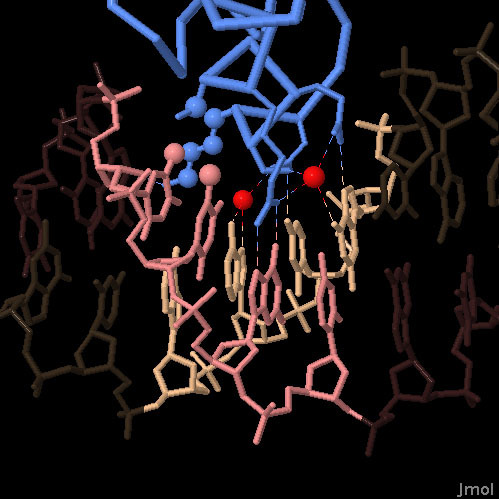 Two water molecules (red spheres) are also positioned by the protein to form hydrogen bonds to the bases. The promoter also includes two thymine bases, which are recognized by hydrophobic contacts. In this picture, the methyl groups on the thymine bases are shown with larger spheres. They are packed against carbon atoms in two sidechains, also shown here with larger spheres. Jian, D., Kim, Y., Maxwell, K.L., Beasley, S., Zhang, R., Gussin, G.N., Edwards, A. M. and Darst, S.A. (2005) Crystal structure of bacteriophage lambda cII and its DNA complex. Molecular Cell 19, 259-269. Dodd, I.B., Shearwin, K.E. and Egan, J.B. (2005) Revisited gene regulation in bacteriophage lambda. Current Opinion in Genetics and Development 15, 145-152. Oppenheim, A.B., Kobiler, O., Stavans, J., Court,D.L. and Adhya, S. (2005) Switches in bacteriophage lambda development. Annual Review of Genetics 39, 409-429.